Happy Spring! Welcome to the Damask Divas’ Taste of Summer Blog Hop. If you came to my page from Traci’s page, then you are in the right place. You can always start at the beginning or navigate to the various participant’s pages by going to the Damask Divas team blog page at http://www.damaskdivas.com or click this link. These papers with their juicy, colorful, fruity prints are so much fun. I made some simple and quick cards to share with you. 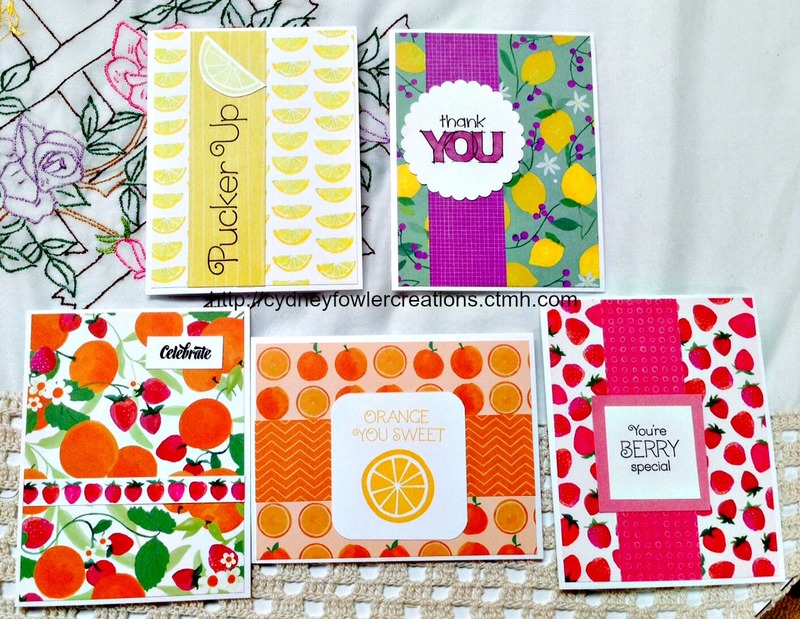 This Taste of Summer paper pack (Item # CC1038) and the coordinating stamp set (CC1039) are the Constant Campaign from Close to my Heart for May 2015. You can only get these papers in May, so be sure to contact me or your own consultant to order. My CTMH online store is located at http://cydneyfowlercreations.ctmh.com or click this link. The celebrate sentiment is from the Dizzy Circles stamp set (Item # C1610). I used coordinating CTMH ink pads and colored the Thank You with a Shin-Han marker (P83 – Lavender). I used CTMH archival ink for the black sentiments. The card bases and envelopes are the White Daisy value pack (Item # X254). Of course, I used my CTMH acrylic blocks to stamp with, and my Versamat to help get a nice clear imprint (Item # Z1279). The Thank You stamp is retired, but still one of my favorites. Your next stop on the hop is Felica’s page. I hope you enjoy seeing all of creations and they inspire you to make your own. Happy Crafting! Thanks, Patricia. Such fun papers make it easy. Oh Cydney, these are just too cute! Love them all!! Creativity in both cards and papers! Thank you, Traci. Aren’t these fun papers?! These are adorable! I love this paper, and just want to use the biggest pieces possible! These cards are so bright and cheery. Thanks, Marion. These are great papers we will want stock up on.